Designers Fountain ES31931-FBZ Parkview Outdoor Wall Light | Fountain City Art Ctr. This 9-Inch outdoor wall lantern is part of the Parkview family. 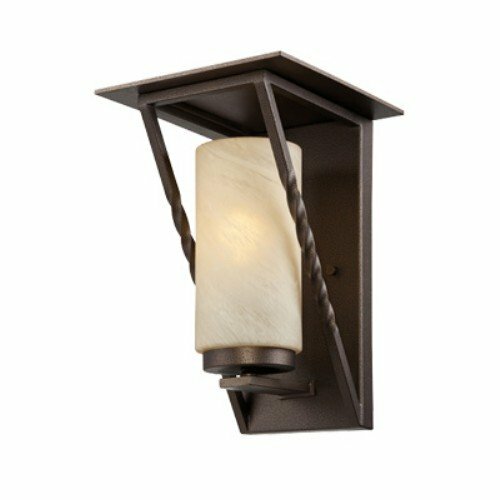 Save on energy while adding a craftsman / mission style to any outdoor or indoor location with this versatile single light wall sconce. Featuring an included 13 watt CFL bulb enclosed in an elegant tea stained French swirl glass shade and Flemish bronze housing, this fixture will enhance the look of any area. The simplicity of twisted iron details are paired with the calming comfort of a glowing candle.